All of us at William Simpson are proud to be continuing our involvement with the National SPCA in sponsoring vehicles to be used by the response units, as well as contributing R1,000 via a referral campaign for every successful sale from a SPCA referral. By partnering with the SPCA and their initiative to bring greater awareness about dog fighting, we decided to take our involvement to the next level in 2017, by sponsoring reliable vehicles that they can trust to keep them on the roads, serving the communities and rescuing helpless animals from the fighting world. Rather than make these kind and lovable animals fight – let’s fight for them, their safety and provide a happier, more loving forever home. With the success of the campaign last year, we've decided to contnue with the initiaitve. Every successful referral from the SPCA, we will be donating R1,000 to the fight against dog fighting in Cape Town and South Africa. 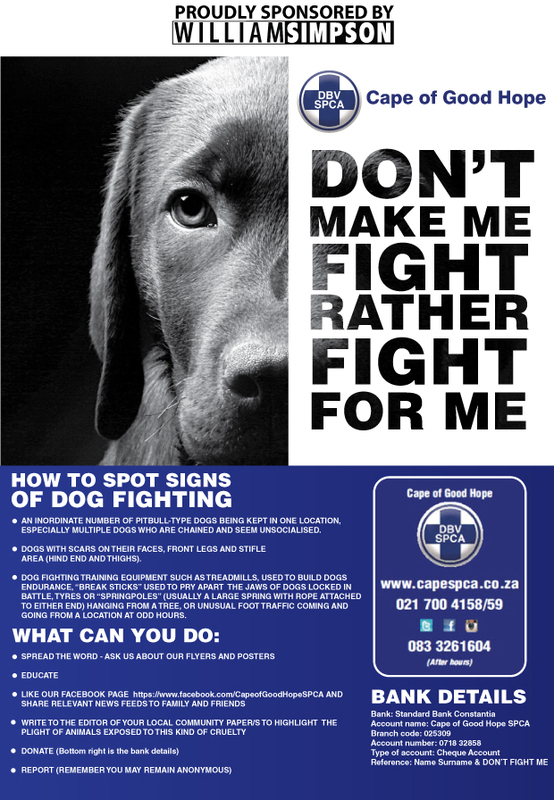 Help us spread the awareness of the SPCA’s brave “Don’t Make Me Fight, Rather Fight for Me” campaign, by sharing this article on social, saving & printing or sharing the image below with family and friends. To find out more about the referral campaign kindly contact claremont@williamsimpson.co.za or see our full list of specials!